We covered costumes and unlocks very briefly in our update What's the Plan: Finances, but when we showed off the Apkallu set, feedback showed that some of you were confused on just how this would work. 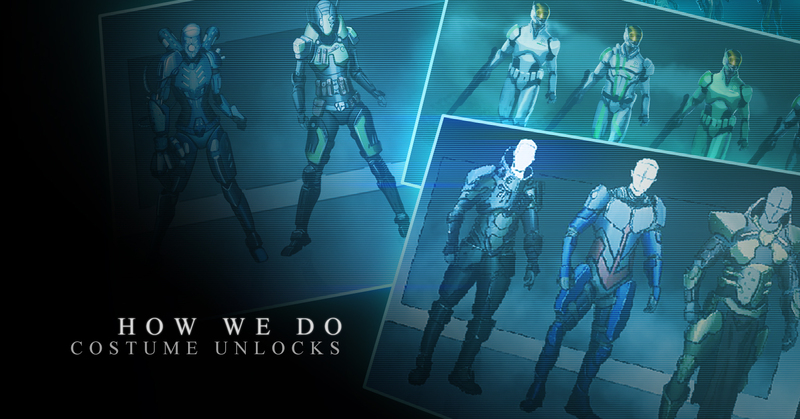 What exactly did we mean when we said you’d unlock them? And even more importantly, what did it mean about how we are handling availability of costumes in general? In this update, we'll take a few moments to get into the finer details of what will require unlocks, and why, and what it will take to get them. First and foremost, we want to reassure you that the majority of our costume and customization options will be available immediately to everyone. However, since City of Titans is partially funded by micro-transactions, there will be some items that are not. You'll be able to see them, and experiment with them, but to use them, you will need to choose from one of two options. First, of course, you can purchase them. 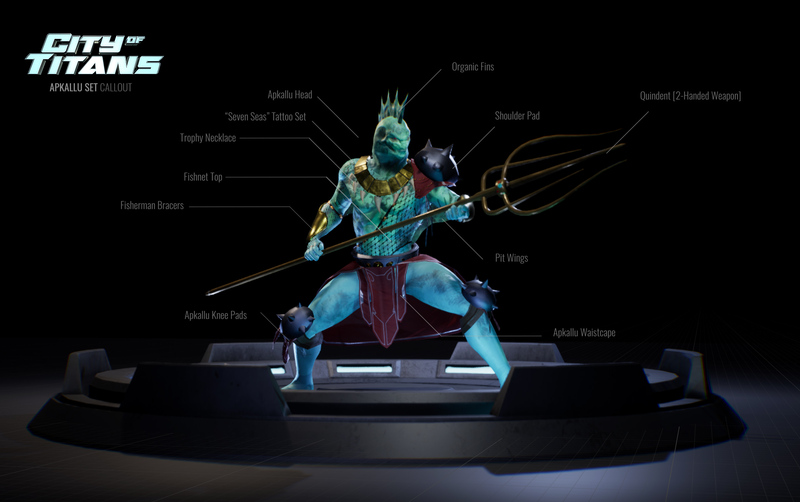 Cosmetics covering not only costume parts but eventually special FX and animations for customizing power appearance will be purchasable from the in-game store. Purchasing items is quick and easy and grants immediate access for your entire account. New and existing characters alike will be able to take advantage of them, making it easy to recreate a favorite look. Of course none of this is new: selling cosmetics is only natural for a customization-centric game like ours and is a popular alternative to the dubious practice of Pay to Win items. However, we are also going one step farther: every one of our cash shop items owned exclusively by City of Titans (we have plans for licensed content) can also be acquired through gameplay. Items unlocked through gameplay will work a little differently. Unlocked assets will only be available to the character that unlocked it, so if you want it for multiple characters you’ll have to earn it multiple times. Some items will come as rewards for completing storylines while others will be available just by exploring the world. Some will be easier to get and some will be harder, but all of them can be acquired through in-game effort alone. While it's generally understood that games need to be profitable, there is a growing awareness of the ways player spending can spiral out of control. We've been actively trying to avoid practices that encourage addiction. To further help players manage their spending, we have decided to build in a budgeting tool, giving you the option of keeping track of every purchase you’ve made and how much you’ve spent. We’re even going to include the option to set a monthly limit on your purchases, so that you can adapt the game to your family’s budget or set an allowance on your accounts. While City of Titans, like any business, does need to make money, our highest priority is to give you a game you love to play. We'll be telling, and showing, you more about in game purchases in the future.